Ever since I made this steamed clam recipe in the comfort of my Brooklyn apartment (in another episode of “Phoebe Versus the Snapchat Timer”), I’ve been on the move. Summer (and endless wedding season), usually means I’m barely home during July and August. But this year I decided to tag along on Charlie’s work travels to LA and Seattle, taking my suitcase nomadry skills up a notch. My travels, though, have been feeding this site more than usual. I decided a few months ago that I wanted to dedicate August on the site to sustainable seafood and easy weeknight meals to make with varieties outside the typical salmon-tuna-shrimp trio. A weekend in Martha’s Vineyard led me to a talk with Paul Greenberg on the subject. And now these two weeks in the Pacific Northwest seem to be another case of what I like to call “synchronicity highway,” seafood edition. Between Pike Place fish market and seafood joints where oyster happy hour begins at 2pm, we’ve been doing a self-guided tour of all the wonderful wild seafood that the west coast has to offer, slowly ticking off many of the species I included in the “best buys” portion of my guide. On Friday, we touched down in Oregon for the vacation leg of our travels. The first stop on our road trip brought us to the Columbia River Gorge area, where plenty of wild Stealhead Trout and Coho Salmon come to spawn. We even visited a hatchery on our way back from a hike that was raising over 6 million teeny tiny fishies in its tanks! The fresh wild salmon we’ve eaten in Oregon, cooked simply with local veggies, has been a culinary highlight. But since you probably have more salmon recipes than you know what to do with (from this site, included), I wanted to knock out some great shellfish dishes for you before I left on my own west coast quest to OD on bivalves. 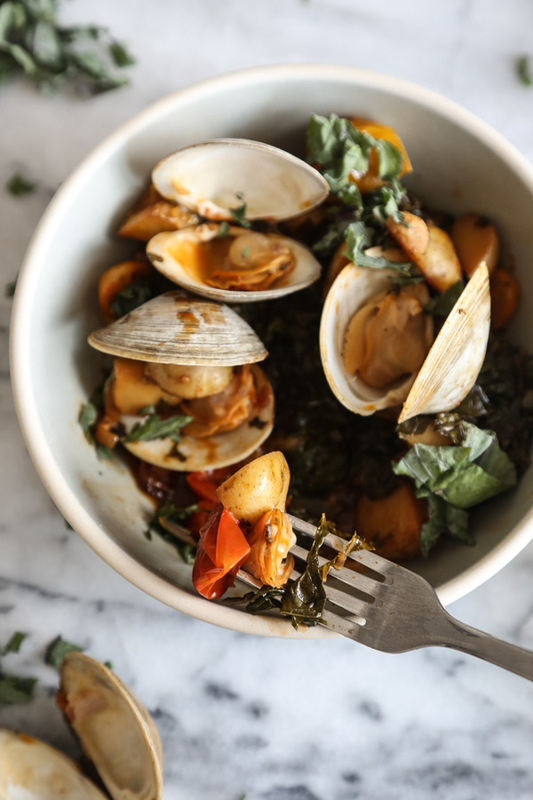 And this steamed clam recipe with chorizo, tomatoes, potatoes and kale (mostly a result of cleaning out my fridge) was a total winner. 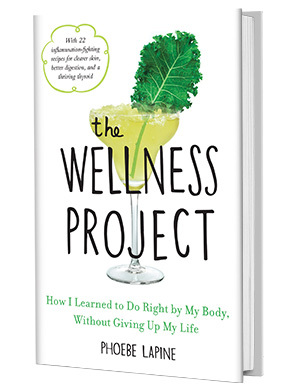 As I mentioned in my sustainable seafood guide, clams and mussels are one of the most affordable, bioavailable, nutrient-dense sources of animal protein around. 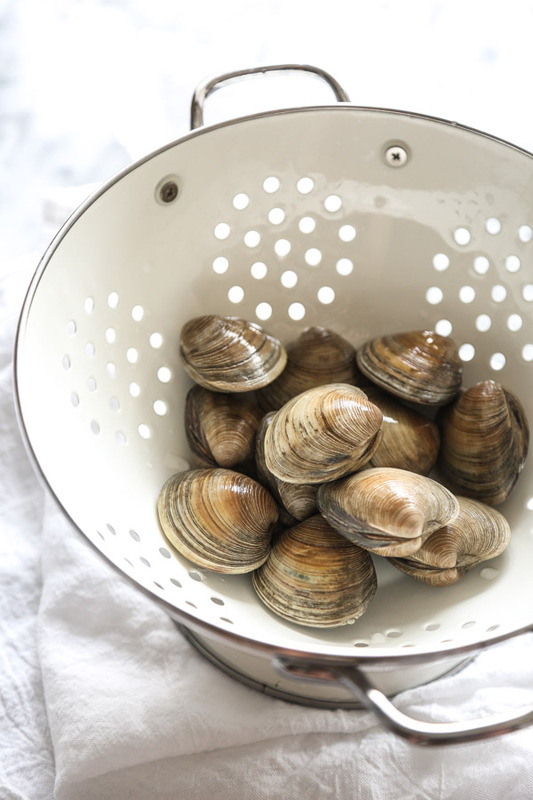 Though they’re technically farmed, these “filter feeding” bivalves actually improve the waters in which they’re introduced, unlike farm-raised fish which require many more resources (feed, water, energy) to raise on an industrial scale. 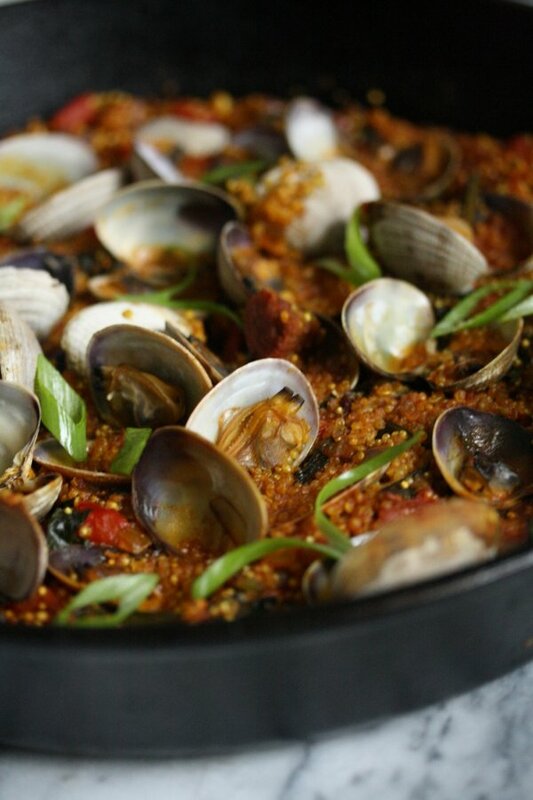 In terms of the health benefits of clams, you couldn’t make a better choice. These cuties are loaded with good fats, iron, zinc and selenium (very important for thyroid health, my Hashi posse!). 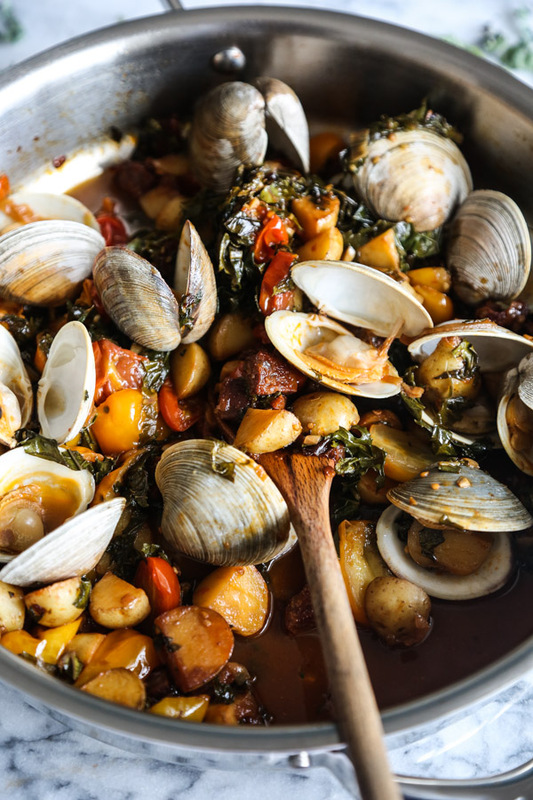 And when it comes to your time, clams are an incredibly easy weeknight meal. This recipe comes together in one pot in just over 30 minutes and could be made in even less time if you chop the potatoes as finely as possible or omit them all together. 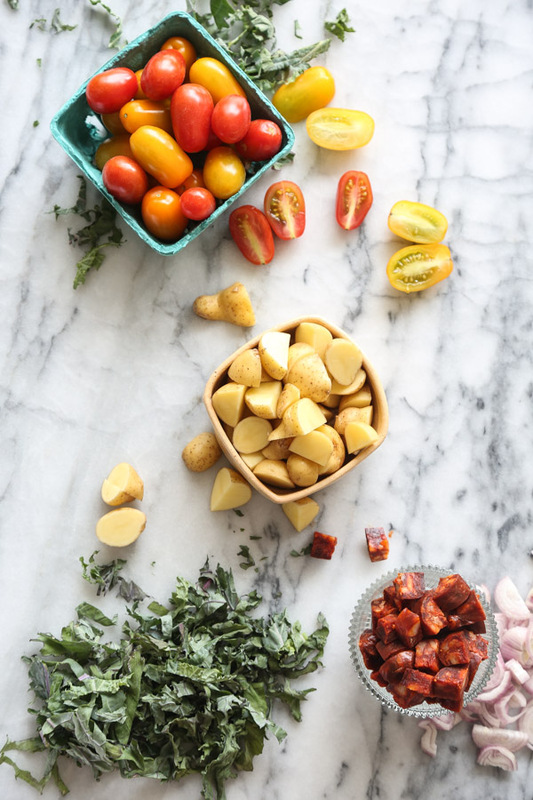 But sausage, kale, tomatoes and potatoes are one of my favorite late summer combinations (see this soup if you don’t believe me). 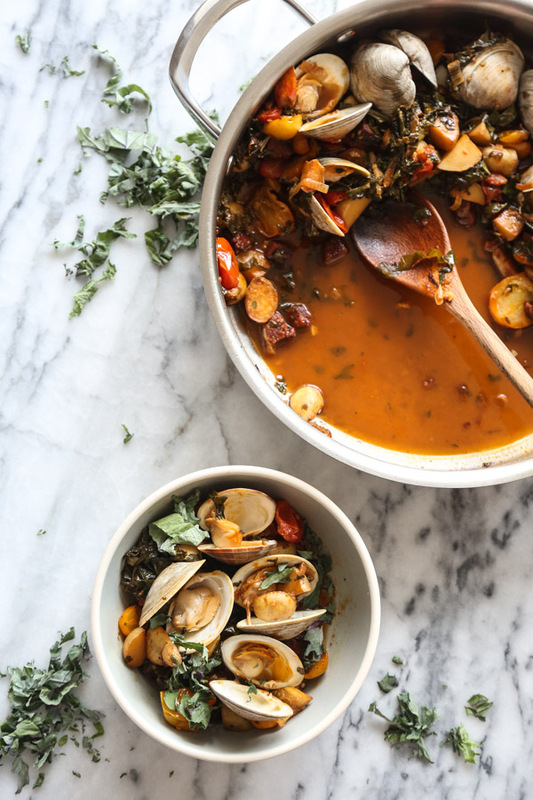 When the weather starts getting crisp at night, it doesn’t get better than a bowl of brothy, hearty summer vegetables and seafood. 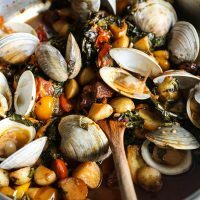 The fresh briny clams and smoky chorizo give you an incredibly flavorful stock without your having to slave over a simmering pot all day. And the addition of the starch and veg (and maybe a little crusty bread on the side, for the hedonists) make the dish a perfectly balanced one pot meal. 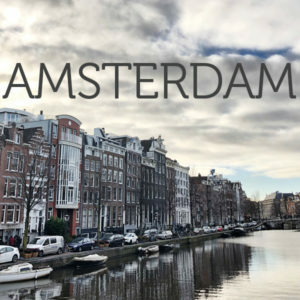 I’ve got more seafood recipes coming your way the second half of the month inspired by my travels. 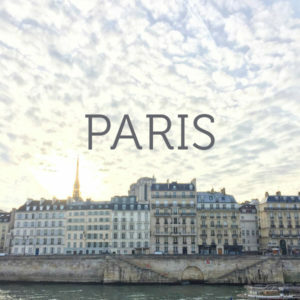 And if you want to follow along, pop by my snapchat (plapine) or stories on the gram! Make sure to cut the potatoes as finely as possible so they don’t take too long to cook. Depending on the appetite of your loved ones, this serves two as a main course one pot meal or four with some additional sides. 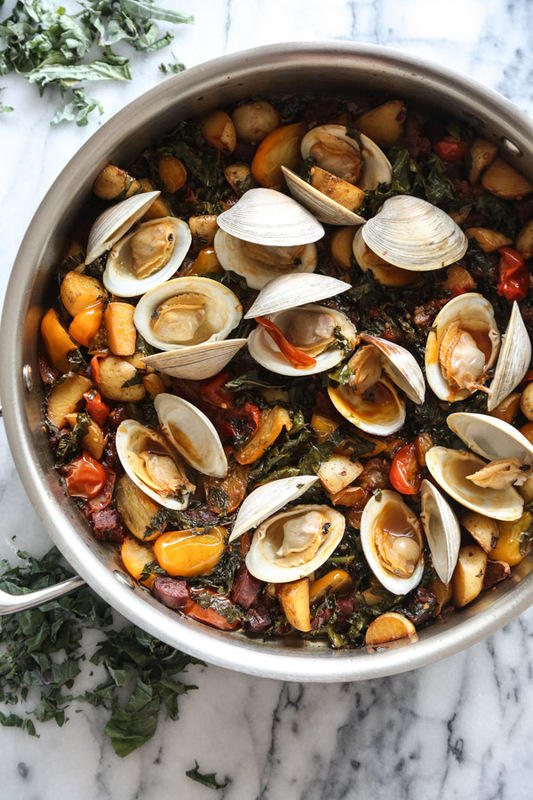 One way to bulk up the meal would be to omit the potatoes and, instead, toss the clams with linguine! Rinse the clams well and place in a large mixing bowl. Cover with cold water and soak while prepping the remaining ingredients. In a large lidded Dutch oven or saucepan, heat the oil. 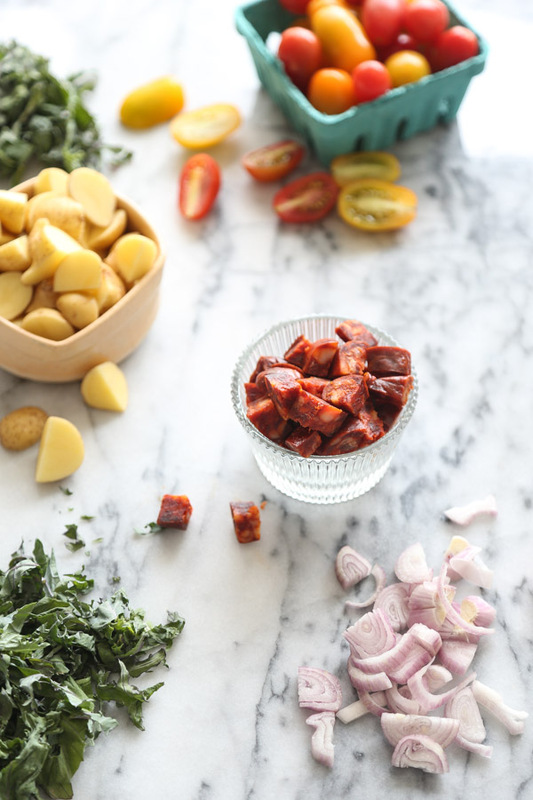 Sauté the chorizo, shallots and potatoes over medium-high heat, stirring occasionally, until the potatoes are browned and the shallots soft, 7 minutes. If brown bits form on the bottom of the pan, don't worry. Add the garlic and cook for one minute more. Stir in the tomatoes and cook until they’re beginning to release their juices, 5 minutes. Pour in the wine, scraping up any brown bits from the bottom of the pan, and season with salt. Simmer until half of the wine has cooked off, 2 minutes. Reduce the heat to low and cook until the potatoes are al dente, depending on the size, another 2 minutes. 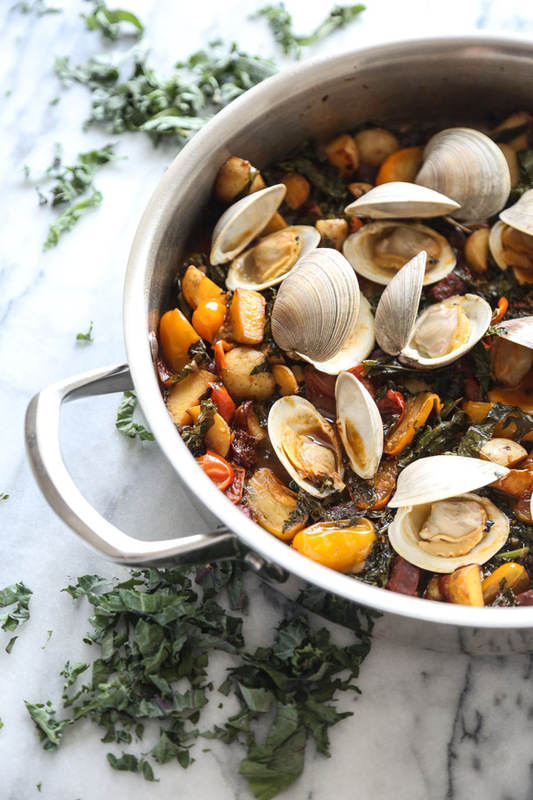 Stir in the kale and arrange the clams on top. Bring the remaining liquid to a simmer over medium heat, place the lid on the pan, and steam for 5 minutes, or until the clams have opened. Serve immediately alongside crusty bread. 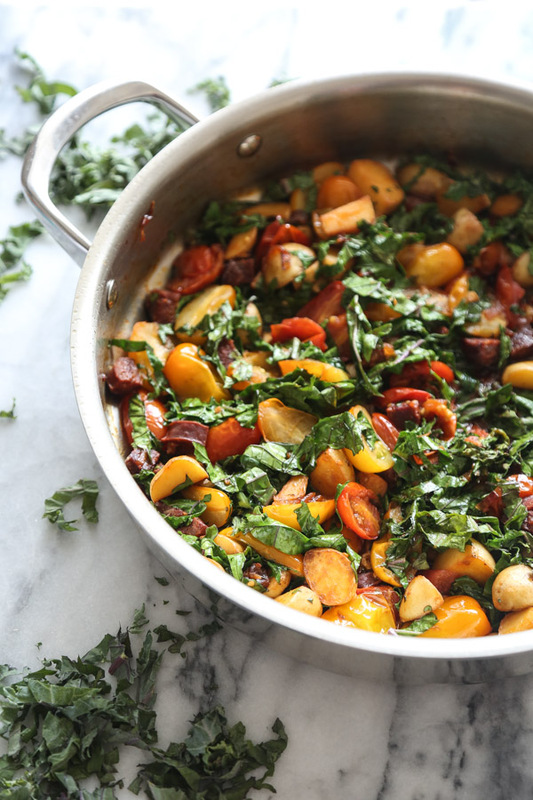 This seems kind of Portuguese (as in yummy) and it’s a nice surprise that you cherry tomatoes – they’re so good right now! I’m afraid of eating clams, though, ever since eating a bad one (raw) like 10 years ago. Would shrimp be OK? This looks outstanding! We have weekend guests arriving tomorrow, and this would be perfect for dinner one night. With a crusty baguette, this will be heaven. Can I just tell you how wonderful this was! My husband cannot stop raving! Thank you, thank you, thank you!